In early August 1945, the USA dropped two atomic bombs on the Japanese cities of Hiroshima and Nagasaki, effectively ending the Second World War. A little more than a decade later, fresh off his acclaimed Concentration Camp documentary short Night And Fog (original title Nuit Et Brouillard), French filmmaker Alain Resnais (Last Year At/In Marienbad) was asked to direct another short documentary, about the atomic bomb. 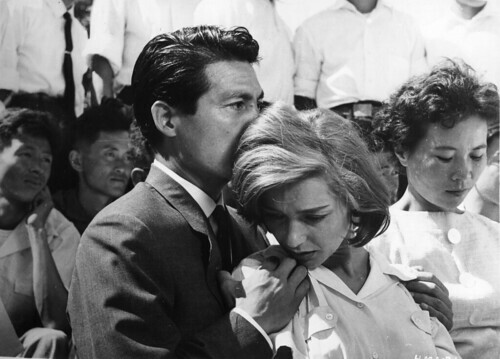 Unconvinced, Resnais ended making not only his first feature-length film, but his first work of fiction as well, Hiroshima Mon Amour (literal translation Hiroshima My Love). Written by celebrated author Marguerite Duras (The Lover), the film tells of the love story between a French actress shooting a film in Hiroshima and a Japanese man she spent the night with, during her last day in town before returning to Paris. The unexpected emotions stir up some old painful feelings from the actress’ past, and serve as a metaphor to Hiroshima’s tragedy. It stars Emmanuelle Riva (Three Colors: Blue) in her first film role, Eiji Okada (Woman In The Dunes) who had to learn his dialogue phonetically, and Bernard Fresson (Brotherhood Of The Wolf) among others. Trailer and first five minutes of the film’s infamous fourteen minute long opening sequence after the jump. First of all this is not a movie you want to watch if you’re in the least bit tired. But this is definitely a movie you want to watch if you’re the least bit interested in cinema. Hiroshima Mon Amour is slow, extremely so. And it is also a very quiet film, not that there is no dialog, on the contrary, just that said dialogs are isolated from surrounding sounds and are actually more long monologues spoken by the French actress with short interruptions by the Japanese businessman. The melodic line delivery, que to Duras’ patrticular style of writing, coupled with Resnais’ beautiful filming and the haunting music by composers Georges Delerue (Platoon) and Giovanni Fusco (L’Avventura) give the film a poetic, dream-like, timeless atmosphere, a consequence of which is that though Hiroshima Mon Amour lasts only 90 minutes, it easily feels an hour longer, thus stressing the importance of not watching the movie when looking for some light entertainment. Though it may not become your movie of choice for multiple repeat viewings (then again? ), the French-Japanese co-production remains an significant film in the history of cinema, due for example to its innovative use of brief flashbacks, and the fact that it’s regarded as one of the first movies of the French New Wave. But more importantly it’s an expertly-made, beautiful piece of cinematic art. You may not enjoy the film itself, but you’d be lying if you weren’ impressed by it in a way or another. Hiroshima Mon Amour remains Alain Resnais’ best-known film and garnered much critical praise, earning a special prize at the Cannes Film Festival and a nomination at the Oscars. Verdict: Definitely watch it, but not when you’re even a little bit sleepy. Hiroshima Mon Amour currently holds an 8/10 on IMDB and a 95% on Rotten Tomatoes. This entry was posted in French Films, Japanese Films, Movie Of The Day, Videos and tagged 1945, Alain Resnais, atomic bomb, Bernard Fresson, Bleu, Blue, Brotherhood Of The Wolf, Cannes Film Festival, Concentration Camp, 砂の女, Eiji Okada, Emmanuelle Riva, French New Wave, Georges Delerue, Giovanni Fusco, Hiroshima, Hiroshima Mon Amour, Hiroshima My Love, L'Amant, L'Année Dernière A Marienbad, L'Avventura, Last Year At Marienbad, Last Year In Marienbad, Le Pacte Des Loups, Marguerite Duras, Nagasaki, Night And Fog, Nouvelle Vague, Nuit Et Brouillard, Oscars, Platoon, Second World War, Suna No Onna, The Lover, Three Colors: Blue, Three Colours: Blue, Trois Couleurs: Bleu, Woman In The Dunes, World War 2, World War II by Mr Hollywood. Bookmark the permalink.